This portrait is an exciting new discovery that joins a small group of watercolor portraits by J. Evans. 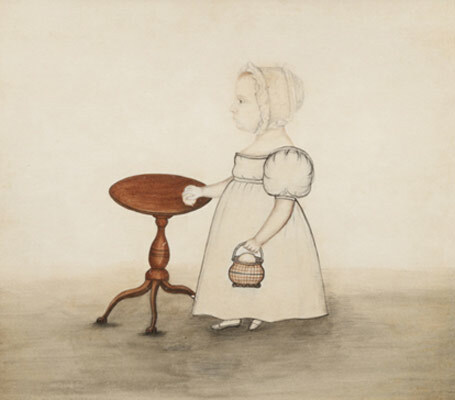 It depicts a standing little girl wearing a lace bonnet and holding what appears to be a paint-decorated basket containing a single peach in her left hand and grasping another peach in her right hand while leaning on the top of a Chippendale style tripod based candlestand with tiny claw-and-ball feet. Of toddler age, the little girl appears to be steadying her stance by leaning on the candlestand. This portrait is distinguished by the inclusion of an early piece of furniture used as a prop, the use of a shaded floor instead of a patterned carpet, and the extraordinary refinement of its execution.